If we just had the time, we'd head north a bit and do a little camping around Crossville, TN. 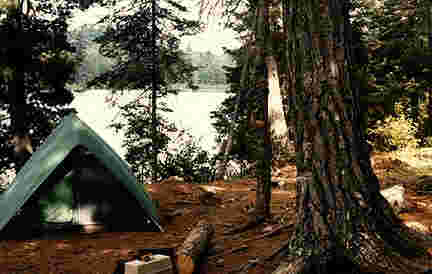 Some of the best campgrounds you'd ever want to see are in this area. But, we must keep pushing west. 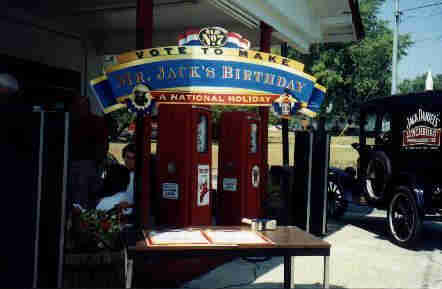 Well, shucks, if we had come this way in 1999, we could have stopped off and enjoyed the Jack Daniel's Birthday Party - maybe even voted to make it a national holiday. Well, we need to keep chuggin' along here, folks. We're headed towards Murfreesboro and some of the prettiest horses you'll ever lay your eyes on. This is the famous Tennessee Walking Horse (or Tennessee Plantation Walker). Originally bred for utility, these beautiful animals have a calm, docile temperament combined with a naturally smooth and easy gait. 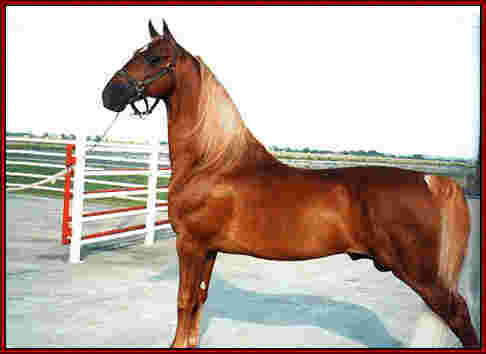 The Tennessee Walking Horse has three natural gaits: the flat foot walk, running walk and canter. 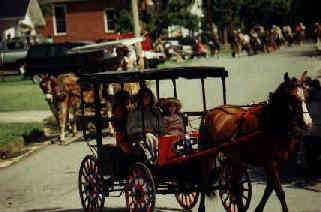 Using the flat foot walk, these horses can cover four to eight miles an hour depending on the terrain. They are great show horses, but many are used simply for pleasure, trail riding, etc. If you ever see one of these high-stepping beauties in a show, it's a sight you'll never forget. 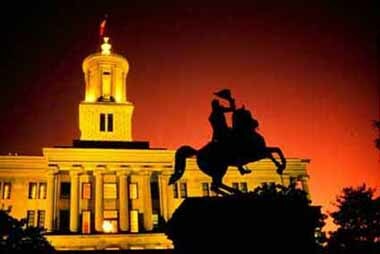 Nashville, originally known as Fort Nashborough, was first settled in 1779 on the banks of the Cumberland River by James Robertson. The Cumberland now runs through the middle of Nashville. 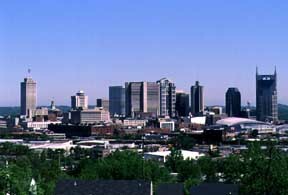 There are over 500,000 residents in the 533 square miles of Metropolitan Nashville and Davidson County. 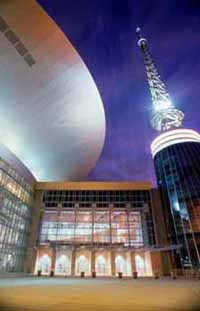 Since we'll be movin' on before nightfall, we thought you'd like to get a glimpse of Nashville at night. There's a lot to see here, so let's fire up the Chevy and move on out. I see we're passing by Vanderbilt University. 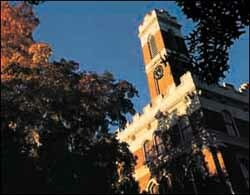 Vanderbilt was founded in 1873 by Commordore Cornelius Vanderbilt. 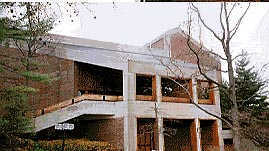 It is a private, comprehensive research institution with a diverse student body of over 10,000 and a faculty of 1,600. 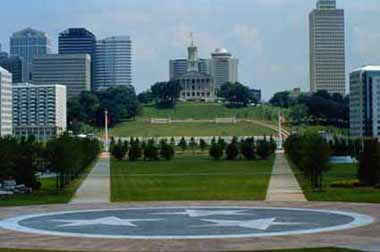 Vandy sits on 333 acres just southwest of downtown Nashville. It is comprised of ten schools, including a renowned teaching hospital. 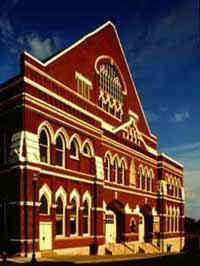 This is the Ryman Auditorium, built in 1892 by Capt. Thomas Ryman as a place to hold religious revivals. Capt. Ryman said about country music, "...it's like the aroma of bacon and eggs frying on a kitchen stove on a bright Spring morning." 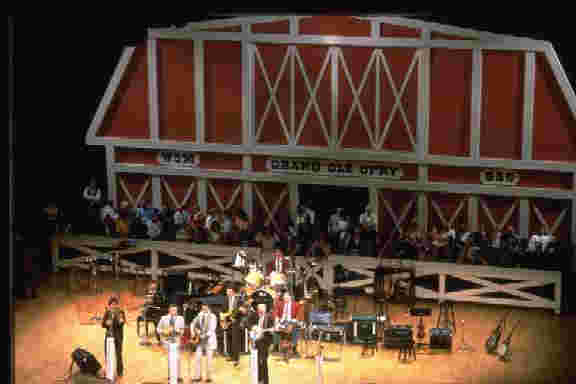 The Grand Ole Opry began performing in the Ryman Auditorium in 1943 and continued until the new Opry House was built in 1974. 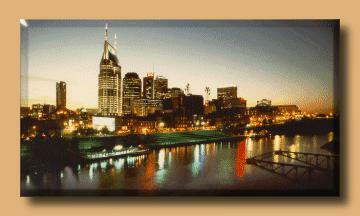 But, there's so much to see and do in Nashville, we'd better move along. This is Adelphia Coliseum, home of the Tennessee Titans, Nashville's NFL football team and 1999 AFC Champions. 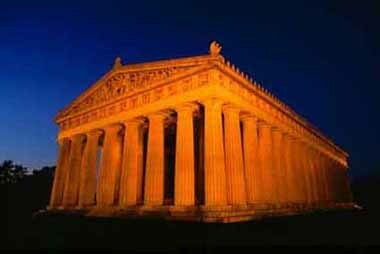 This is the Parthenon in Centennial Park, and the reason Nashville is called the "Athens of the South." We could spend a week here and still not see everything, but it's time to climb back into the Chevy, click on the license plate, and let's head toward Memphis.